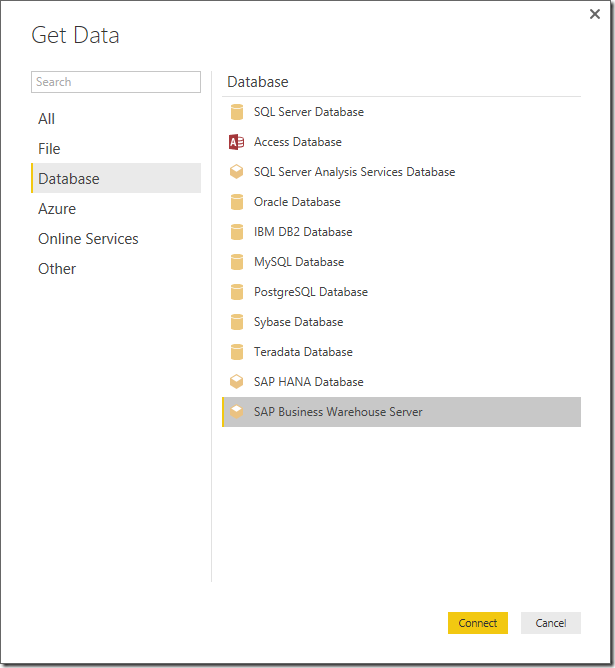 Install the SAP RFC SDK (version 6.4 or greater) in your local machine (that is, the machine that is running Power BI Desktop). You can get this component from your SAP Administrator, or directly from the SAP Service Marketplace. 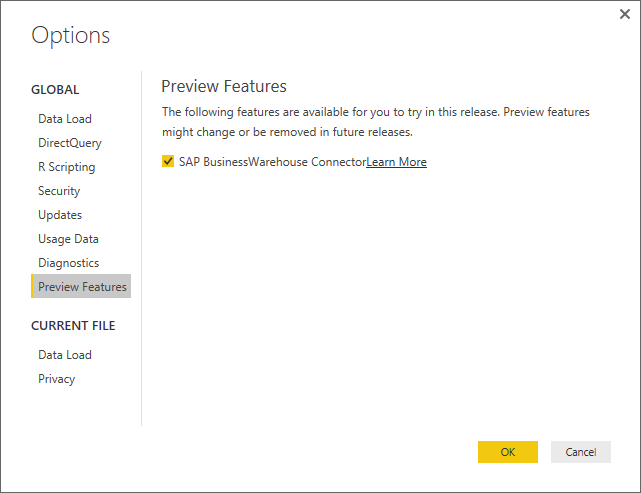 Enable the “SAP Business Warehouse Connector” Preview feature in Power BI Desktop. This can be done from the File menu, under “Options and Settings -> Options -> Global -> Preview Features”. Note that you will need to restart Power BI Desktop after enabling this feature. After performing step #3, you will need to close and reopen Power BI Desktop. 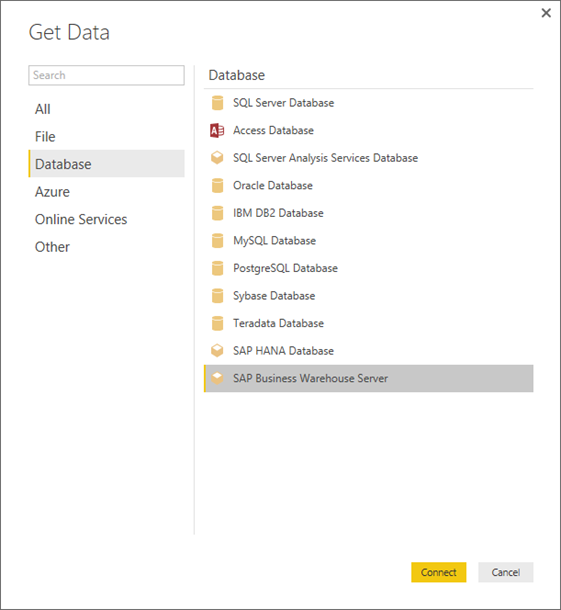 Once in the new Power BI Desktop instance, you will be able to find the new connector under the “Get Data” dialog, within the Database category. After selecting this connector in the “Get Data” dialog, users will need to specify a Server, System Number and Client ID in order to establish the connection. Note that users could also specify two additional Advanced Options: Command Timeout for connecting to the data source and a custom MDX statement to run against the specified server. If users did not specify an MDX statement to run, they will be presented with the Navigator dialog. This dialog allows users to see the list of cubes available in the server and drill down to explore and select items from these cubes, including dimensions and measures. Please note that Hierarchies and variables/parameters are currently not supported in this Preview version, but will be supported in the future. Users can select one or more items from the server and this will generate a preview of the output table, based on their selection. Display “Only Selected Items” vs. “All Items” (default view): this option is useful for verifying the final set of items selected. An alternative way of seeing this consists on checking the Column Names in the Preview area. “Enable Data Previews” (default behavior): Users can also control whether data previews should be displayed in this dialog or not. Disabling data previews will reduce the amount of server calls as it will no longer request data for the previews. “Technical Names”: SAP BW supports the notion of “technical names” for objects within a cube. Technical names allow a cube owner to expose “user friendly” names for cube objects, as opposed to only exposing the “physical names” for those objects in the cube. 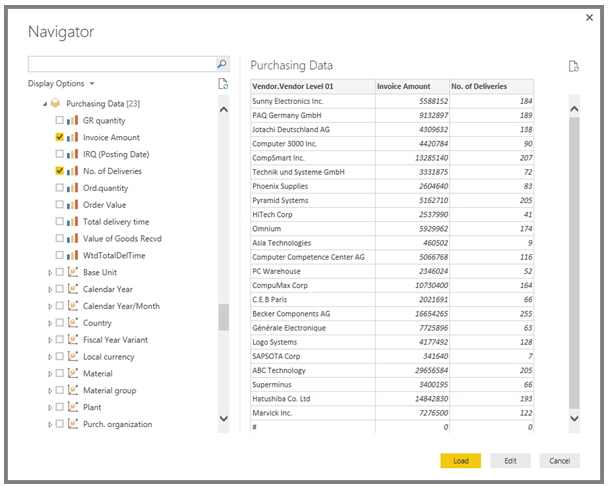 Load: This button will trigger loading the entire set of rows for the output table into the Power BI Desktop data model, bringing the users into the Report view where they can start visualizing the data or making further modifications via the Data & Relationships views. Edit: This button will take the user into the Query Editor dialog. The Query Editor dialog allows users to apply additional data transformations and filtering steps to their data before the entire set of rows is downloaded to the data model. Note that, in addition to importing data from SAP BW cubes, users can also import data from a wide range of additional data sources in Power BI Desktop and combine data from multiple sources into a single report. This opens up lots of interesting scenarios for reporting and analytics on top of SAP BW data. We hope that you give this Preview connector a try and share feedback about the experience and capabilities with us, by using the “Send a Smile/Frown” buttons in Power BI Desktop. We will take your feedback into account as we consider additional improvements to this new connector. 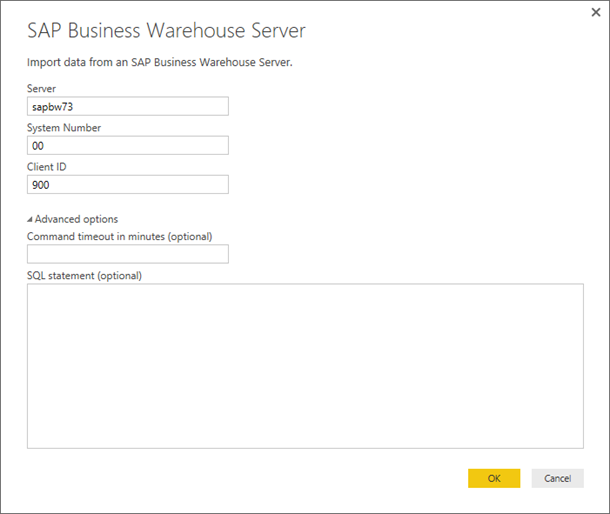 Do you want to learn more about the SAP BW connector and other SAP connectivity options in Power BI? If so, you will want to join the upcoming “Connecting to SAP data with Power BI” webinar.